The policy for suitcase sizes for cabin luggage and checked bags always depends on the airline that operates your flight. Low cost airlines tend to have smaller hand luggage allowances while the traditional airlines tend to stick to the dimensions 56 x 45 x 25cm. 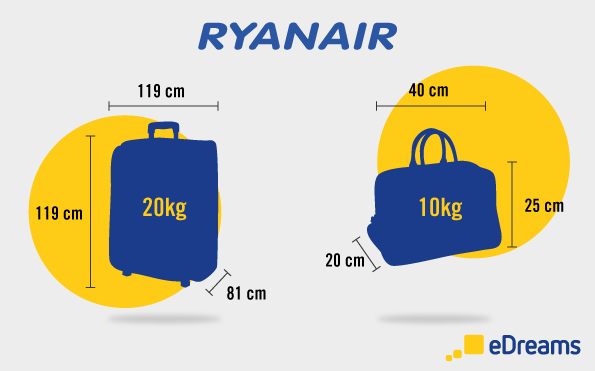 Because of the confusion this can cause, we’ve decided to make life a little easier and compile all the information related to luggage size and weight restrictions for Ryanair, British Airways, Vueling, Air France, and easyJet flights. PS – Before reading the list we suggest taking a look at the best travel tips and advice for a safe trip. All the passengers with priority boarding can carry one small bag (40cm x 20cm x 25cm) for free and another cabin bag (55 x 40 x 20cm) with a maximum weight allowance of 10kg. The non-priority passengers can only travel with one small bag (40cm x 20cm x 25cm) for free which should fit into the sizer. A bigger bag can be purchased online for a lower cost, or at the airport for a higher cost, and should not exceed 10kg. 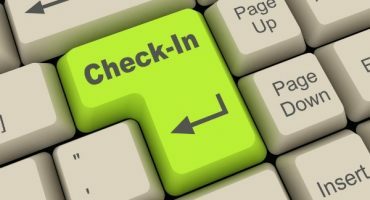 As for the checked luggage, each passenger can travel with up to 3 bags of 15kg or 20kg each, that can be purchased online (€25/£25) or at the airport or call centre (€40/£40). In case the checked baggage weights more than what was booked (15kg or 20kg), there’s an excess baggage fee that costs £10 per kg, which can be purchased up to 32kg in total. For health and safety reasons Ryanair does not allow articles that weigh more than 32kg or have dimensions larger than 81 x 119 x 119 cm. This weight limit does not apply to mobility equipment. Read more Ryanair flights tips. 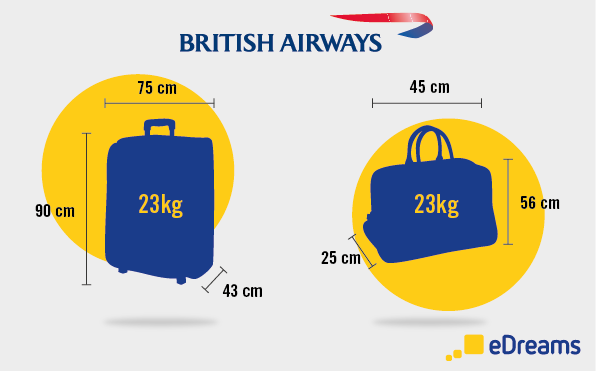 The British Airways carry-on baggage allowance states that the standard measurements for baggage cannot exceed 56 x 45 x 25 cm, including handles, pockets and wheels and the second bag or laptop bag cannot exceed 45 x 36 x 20 cm. Cabin luggage must fit into the bag gauge which simulates the size of the overhead bins provided at the ticketing counter or under the passenger seat. 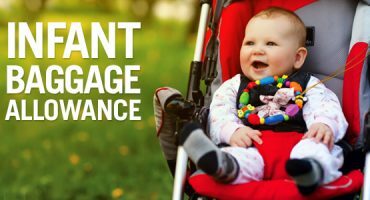 British Airways has a free checked baggage allowance, which varies depending on the class of travel and type of ticket you book. Additional bags may be subject to a fee. Routes that are operated by a different airline on behalf of British Airways may have different baggage allowances. In some routes the aircraft used by these airlines are smaller than those used by British Airways, so the cabin space is limited, meaning the weight and size limits are also lower. Read more about the British Airways baggage allowance policy. ✈️ Search flights with British Airways! 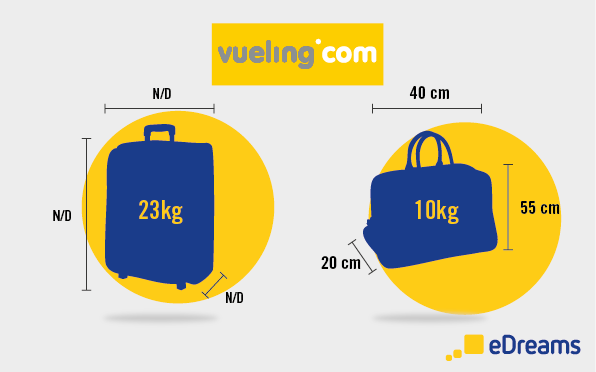 Each passenger may carry one piece of hand luggage on Vueling flights with a maximum weight of 10kg and dimensions that do not exceed 55 x 40 x 20 cm. The only exception is for Excellence Fare passengers, as they are allowed to bring up to 14kg of hand luggage. In addition, each passenger is allowed to carry one of the following items at no additional charge: a small purse or wallet, a coat or travel blanket, a laptop, or camera. While at the boarding gate, bags that breach the Vueling Airlines baggage rules, ie exceeding the amount, weight or measures stipulated, will cost €30 per bag. Passengers traveling on the Basic Fare can purchase checked luggage. The price is between €13-25 per flight and suitcase. Passengers traveling on the Optimum Fare or Excellence Fare have 23kg of checked baggage included in their ticket price. The 23kg can be in one suitcase or distributed in numerous suitcases as long as the total does not pass 23kg. Any luggage over 23kg will be subject to an overweight baggage fee which is €12/extra kilo. To check more bags on Vueling flights you can do so online or by calling Customer Service. Passengers can pay to bring up to 50kg each, with a maximum weight of 32kg in one single piece of luggage. Passengers that have not paid to check their bag ahead of time will pay an increased fee of €35 per flight and suitcase. The easyJet baggage allowance for hand lugagge is one piece with the maximum dimensions of 56 x 45 x 25 cm and a max weight of 10kg. Handbags, briefcases, and laptops count as one bag as well so if you will need to check a bag paying the fee is you arrive at the boarding gate with too many items. 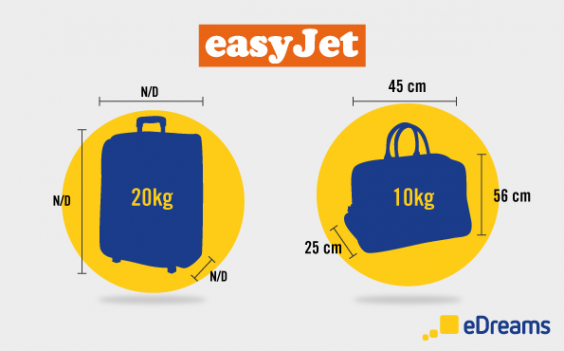 If you want to guarantee that your cabin bag travels onboard with you, the easyJet new cabin bag guaranteee states the maximum size is reduced to 50 x 40 x 20 cm. Luggage is not free to check on easyJet flights, each passenger must pay a hold luggage fee between €13-25/£10-20 during the online booking process to bring a maximum of 20 kg. There is no limit to the amount of hold luggage you may check, but the total for all articles cannot exceed 20 kg. Read more about easyJet luggage restrictions. ✈️ Search flights with easyJet! The Jet2 hand luggage policy states passengers may bring on-board one piece of cabin luggage with maximum dimensions of 56 x 45 x 25 cm and a maximum weight of 10 kg. Any bags passing these limits will be checked into the hold at an additional fee. Jet2 does not offer a free checked baggage allowance. Passengers that need to check a bag can pay ahead of time online during the booking process, or at the airport for an increased fee. Each passenger can check up to three bags with a maximum weight of 22 kg per bag, however allowances may be pooled. 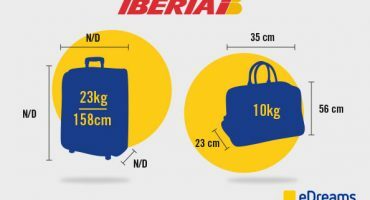 This means that if you pay for two checked bags on one booking you can bring a total of 44 kg distributed between the two bags, but no individual piece of luggage can weight more than 32 kg. 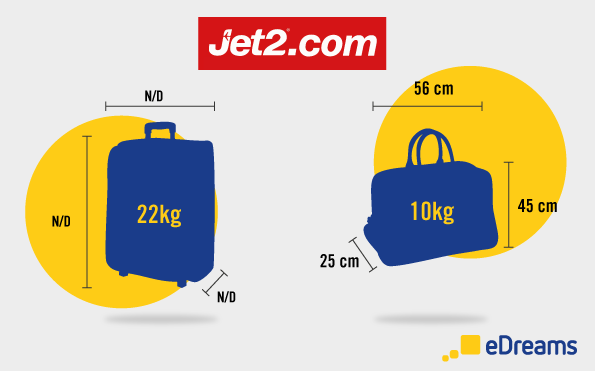 Read more about Jet2 luggage restrictions. The Air France carry-on regulations state that cabin luggage must respect the defined dimensions of 55 x 35 x 25 cm including pockets, wheels, and handles. Passengers are also allowed one personal item (laptop, briefcase, handbag, etc). The total allowed weight for the two pieces items can not pass 12kg. If your luggage exceeds 158 cm (length + width + height) or the authorized weight 23kg you must pay an extra fee. Checked luggage on Air France flights can not weigh more than 32kg legally, bags passing this limit will not be allowed to fly. ✈️ Search flights with Air France! ATTENTION: If your baggage exceeds the permitted weight and measurements established by each company they may remove it and load it into the hold of the aircraft, sometimes at an additional cost. Hi there, i have a flight booked for 25th Feb with RyanAir, can you please clarify what the current baggage limits are? I have a small cabin case and a handbag which is large? CAN I ASK 1 THING PLEASE , where i can find a link to write an email to edream about i want some information of flight with luggage i can take 10kg cabin luggage for FINAIR or not , i had already booked flight with edreams . 1 piece(s) of luggage per traveller. Hi I booked with EDreams and selected to pay for check in baggage on both flights and paid the extra money for both flights. However on my flights (e.g BA Website) it doesn’t say Ive got the baggage and on the email confirmation from edreams, there is no breakdown of payments so it doesn’t state I’ve paid for it. However my total amount of price paid includes this fee. How do I know for sure it added the baggage and not just taken my money? I have just booked a flight through edreams website for my mother on Bulgaria Air flight FB 851 Sofia to London Heathrow for Sat 28 Nov 2015. On the website I saw that baggage allowance is included. I have just received not 1 but 2 confirmation e-mails stating Baggage 0? What exactly baggage allowance is included in the price that I paid? in my flight details there was mantioned that ” 2pieces of baggage included for free each way in ticket fare”. But after reeding reviews I am still in worry should I pay any fee for hand and checked baggages? Hi, I am flying from Auckland to Brisbane, How much do I pay for checked baggage? Hi, did you book through eDreams.com? If so, please contact our customer service to add your additional baggage. Shanghai Airlines from Japan to China. During the booking process, it said: 2 pieces of baggage included for free each way in ticket fare. Does this mean I have or don’t have free baggage? i just booked ticket through online.i didn’t know that i have to pay for the 2nd bag(1st is carry on) there is no option to add baggage. that ticket i booked the EASYJET ticket was london to germany, I did it from canada. how can i add the 2nd bag by online. Hi. We have flight booked with airfrance from London to Istanbul. It says on ticket “zero checked baggage”. Are we still allowed to take hand carry ? Hi, taha. The “checked baggage” only refers to the baggage that will be placed in the airplane’s hold. Your hand luggage is allowed. Thanks! Hi… i have booked a flight with you with AIR FRANCE and booking ref# 47GG8A, and my flight schedule for this coming sat 14mar2015, 1155hrs from dublin to cdg airport. I would like to know if i will pay the extra baggage almost 20kgs (one travelling bag). and if any, how can i pay via online but i’m still lookin for more cheaper. pls respond asap, many thanks. Hi Ramon. 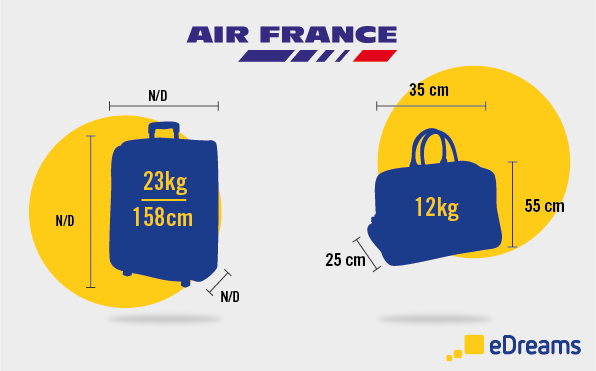 With Air France you are allowed to have a luggage no larger than 158 cm (length + width + height) and the authorized weight is 23kg, which means your 20kg bag should be fine. Thanks! Hi Ramon. Thanks for reaching out. 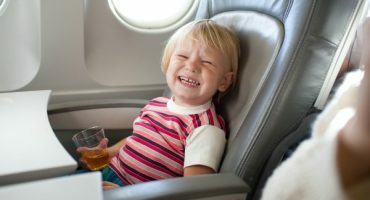 If you have purchased seats for your children, the same baggage allowance applies to your kids. Everyone is allowed to carry 1 checked bag, not weighing more than 23kg. If you still would like to travel with just one bag for the entire family, please note the authorized weight is 23kg. Anything heavier than that would be subject to excess baggage fees. We hope that was helpful. Happy travelling! Hi, Trent. Thanks for reaching out with your inquiry. You are correct: There is a max weight of 32kg for checked baggage. Though the max of 32kg is part of your baggage allowance with TAP Portugal, it is not however, part of the baggage allowance for Vueling. When flying with Vueling, checking in luggage costs €35 euro each flight. Each passenger can check in a maximum of 3 cases weighing up to 23 kg per item. If the maximum allowance is exceeded, you will be charged €12 per excess kg at the airport per case each way up to a maximum of 32 kg per case. We hope that was helpful. Happy flying! Booked BA flight to hong kong and cant understand if I check in 23 kg in hold can i take a another 23kg into cabin with correct size case ? Hi, Just booked a flight through eDreams, United Airways, what is the baggage allowance? There wasn’t an option to add anything at payment. It’s a bit confusing guys, isn’t it?! Can anyone help? I booked my ticket with british airways from chennai to philadelphia for august 1st.I did booking with cheapoair.com.On the ticket it was mentioned that the free baggage allowance is 2.If it 2 then we cant carry one extra cabin bag i think.I am totally confused.Please some one help me out in this regard..
Hi, I am worried about booking with EDreams, I have been quoted a price with EDreams for British Airways, I noticed on the left hand side it said I may need to pay extra for baggage… On British Airways’ website it states I get the first checked bag for free up to 23kg, if I book with Edreams and do not pay for the ‘extra baggage’ from edreams, does that mean I do not been get my British Airways’ 23kg?? Please can this be clarifies before I book. Hi @taranvirgill:disqus, you will have the free baggage allowance that British Airways states. If you pay for a 20kg checked bag with Ryanair and with Easyjet. Remember there is no free checked baggage allowance for these companies.